Creeping in the dark you run inside the cave, facing strange creatures, blasting Space Pirates, getting power-ups that allow you to explore the setting even further. There are no friendly characters, at least that’s what it looks like at first. While yes, you control Samus, not a word is uttered by her. In that solitude, mashed with the inherent weirdness of the setting, splashed with the violent manner in which you need to trek forward in your quest, it’s no wonder why Metroid has inspired so many artists through the ages. And while yes, the owner of the rights for the series seem to have forgotten about the important date of 30 years of Metroid, here we take a deeper look into our favorite pieces posted on the website.For a gallery with 30 pieces of artwork, click here. Something that always captures the mind of artists is the person behind the suit. In this piece by Alex Figini, we see Samus interacting with one of her power armor. A more mechanical, perhaps realistic approach for “suiting up”. Andy Timm’s sharp artwork crosses Metroid with the Predator and the Alien universe, the latter was one of the main inspirations behind Metroid as a series. The foggy, organic cave, the fated encounter of these three iconic characters… Metroid was clearly inspired by sci-fi tropes while creating it’s aesthetic and own tropes. In the first of Sergio’s pieces, we got color! Action! Excitement! Perhaps a bit too cheerful to truly grasp what the series was all about but the ‘party’ feeling meshes well with the anniversary nature of this post. His second piece, a battle-scarred Samus wearing her fabled suit is something you’d expect in a movie poster. And we close the book on our featured artists with Gabriel Ramos, we decided to showcase the “Zero Suit” – Samus special outfit for when she’s out her suit. It was first introduced in Metroid: Zero Mission but it’s quite popular for fan works, though a bit controversial. Isn’t Metroid supposed to be about solitude, running through dark caves and industrial complexes as a masked and armored Samus? 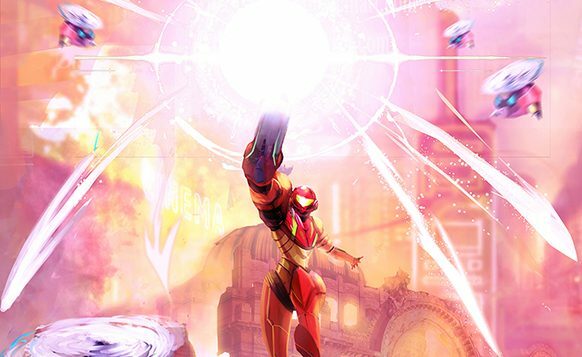 Perhaps the Zero Suit is an expansion of the basic concept, a way to put Samus in evidence. Or perhaps it’s something that needs more development. In say, perhaps a new game? An anniversary game? Maybe in the next 30 years, we can get one.